Don't wait for the holidays to serve turkey. Your small dog will be thankful it's eating a tasty and nutritious meal more often. This pâté-style loaf with turkey provides complete, balanced nutrition and a source of moisture that can be beneficial to small dogs. Gram-for-gram, wet foods like the CESAR® brand have fewer calories than dry food. Paired with CESAR® Dry food, the 100g serving makes a perfect meal for small dogs. 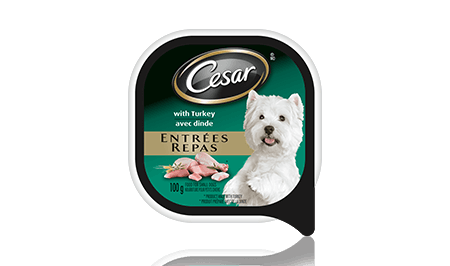 CESAR® ENTRÉES: WITH TURKEY 100g is rated 4.4 out of 5 by 51. Rated 5 out of 5 by LISAHON_3561400569 from My dog really enjoyed the product however he has a dry dog food diet. I usually mix it with just a quarter teaspoon of chicken breast. So I used the Caesar Turkey as a mix for my my dry dog food. He loved the smell, he loved the taste. I will continue buying it as a mix but not as a meal replacement. I also would not recommend this to a friend due to the cost for such a small portion. The packaging is nice and eye-catching but that may be what is keeping the price high. Thank you for allowing me to sample this product. Rated 5 out of 5 by PHILANA_RMON_3561393570 from We give wet food to our dog as a treat and were very happy to try this sample. Our dog found it delicious (because he ate it out quite quickly and looked at us as if asking for more). There was no awful smell to the food (not rank) and my dog didnt smell after either. This is a brand of dog food i would recommend to friends and family and also that i would purchase. Rated 5 out of 5 by CARA_FON_3561397855 from My dog goes crazy for Cesars. He even knows the word and goes crazy. I'm not sure if it has any health benefits but it certainly serves as a good treat and substitute to regular dry food. My dog enjoyed this flavour and I will definitely be purchasing in the future. I highly recommend this product to other dog owners! Rated 5 out of 5 by BRIGITTEKON_3561397029 from Our puppy is very finicky and we've been adding moist food to her dry kibble. As she is little we chose Cesar. Although not too keen on the mixed entrees (ie. with pasta, veggies.....looks like real stew)...she absolutely went nuts for this turkey pate. We will be purchasing it again. Rated 5 out of 5 by BRENDANMON_3561389227 from My dog normally eats an oral care product that is somewhat tasteless and hard to chew. The Cesar Entree was treat for my dog. I think it is better to provide treats for dogs that are more suited to their dietary needs than give them human food. Rated 3 out of 5 by ELENACON_3561377698 from Though they seemed interested at first (had a few bites) they quickly lost interest. I do have picky pups, which could contribute with them not wanting to eat it or it could be the palatability and ingredients. Rated 5 out of 5 by LAURIE_BBC_3561373973 from My dog hears the foil top being opened and runs to where I am in anticipation of this turkey Cesar for breakfast. My dog is a very picky eater but loves this product! I will surely be buying this again ! CESAR® Entrées With Turkey Food For Small Dogs is formulated to meet the nutritional levels established by the AAFCO Dog Food Nutrient Profiles for maintenance. MEAT BY-PRODUCTS, LIVER, TURKEY, CHICKEN, CHICKEN BY-PRODUCTS, MINERALS AND VITAMINS, GUMS, COLOURS, DRIED YAM, NATURAL FLAVOURS, SODIUM NITRITE (FOR COLOUR RETENTION), WATER SUFFICIENT FOR PROCESSING.